I was absolutely ecstatic when I discovered that I had won a painting holiday. It was such a wonderful surprise, I was thrilled at my unexpected good fortune. This holiday surpassed all four other painting holidays that I had been on previously. In fact I learnt more in the last 4 days than I have in the previous 4 holidays! Michael oozed knowledge. He is a patient and encouraging tutor for all levels of ability. I would have no hesitation in recommending him to anyone. Hopefully, I can continue with much more confidence now. Coming on this holiday was a lovely way of meeting a diverse group of people from all over the world with a common love of art. Each member of the group brings their own vitality and I now have the bonus of a new friend in America!!! We painted in a variety of locations, all with different challenges to be met head on. Michael is an excellent tutor, very encouraging and very knowledgeable. He helped everyone achieve so much. We are learnt different methods and techniques. 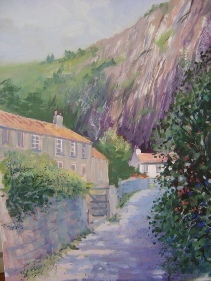 Michael Sanders, Cheddar & The Mendip Hills - Paint Somerset in Any Media.